Area 51 (also known as Dreamland, Watertown, The Ranch, Paradise Ranch, The Farm, The Box, Groom Lake, and The Directorate for Development Plans Area) is a remote tract of land in southern Nevada, owned by the federal government of the United States, containing an airfield apparently used for the secret development and testing of new military aircraft. It is famed as the subject of many UFO conspiracy theories. Area 51 is a section of land of approximately 60 sq. mi. / 155 km² in Lincoln County, Nevada, USA. It is part of the vast (4687 sq. mi. / 12139 km²) Nellis Air Force Range (NAFR). The area consists largely of the wide Emigrant Valley, framed by the Groom and Papoose mountain ranges (to the North and South respectively) and the Jumbled Hills to the East. Between the two ranges lies Groom Dry Lake (37°16′05″N, 115°47′58″W), a dry alkali lake bed roughly three miles (5 km) in diameter. A large air base exists on the southwest corner of the lake (37°14′N 115°49′W) with two concrete runways, one of which extends onto the lake bed, and four unprepared runways on the lake bed itself. High-resolution satellite images have shed some light on the facility's complex runway layouts. Area 51 has two operating runways, the main is 14L/32R, a concrete runway constructed in the 1990s, measuring 11,980 x 200 ft (3651 x 61 m) with a 1000 x 100 ft (304 x 30 m) overrun at each end and the secondary, shorter runway is 12/30 which also doubles as a taxiway, measuring 5,420ft x 150ft (1,652m x 45m). The older runway is exactly six miles (9656 m) long. It is composed of 12,500 ft of concrete, 11,080 ft of asphalt, and 5560 ft and 2540 ft of now dismantled asphalt on the north and south ends respectively. At least three sets of old runway markings are found, suggesting that the full six-mile length was probably never used in its entirety. Currently only a 6,600 ft (2011 m) stretch of the concrete section is marked for use, forming runway 14R/32L. The dirt lakebed runways, comprising two twin airstrips, measure up to 11,270 ft (3435 m) in length and 100 to 170 ft (30 to 52 m) in width. Area 51 shares a border with the Yucca Flats region of the Nevada Test Site (NTS), the location of many of the U.S. Department of Energy's nuclear weapons tests. The Yucca Mountain nuclear storage facility is approximately 40 miles (64km) southwest of Groom Lake. 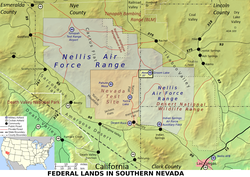 The designation "Area 51" is somewhat contentious, appearing on older maps of the NTS but not newer ones, but the same naming scheme is used for other parts of the Nevada Test Site. The area is connected to the internal NTS road network, with paved roads leading both to Mercury to the northwest and west to Yucca Flats. Leading northeast from the lake, Groom Lake Road (a wide, well-conditioned dirt road) runs through a pass in the Jumbled Hills. Groom Lake Road was formerly the track leading to mines in the Groom basin, but has been improved since their closure. 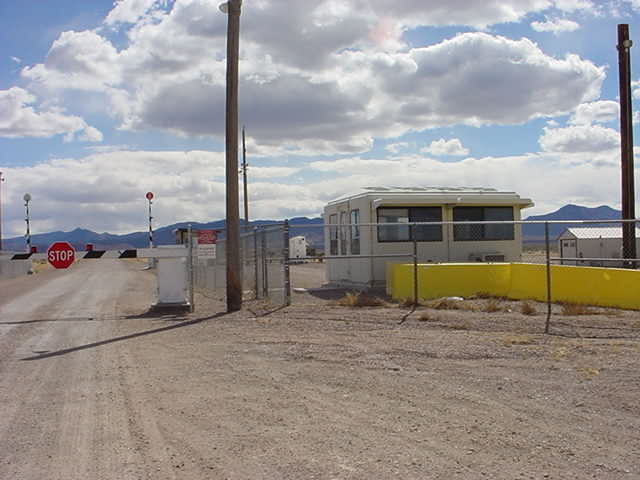 Its winding course takes it past a security checkpoint, but the restricted area around the base extends further east than this (unauthorized visitors who travel west on Groom Lake Road are usually observed first by guards located on the hills surrounding the pass, still several miles from the checkpoint). After leaving the restricted area (marked by numerous warning signs stating that "photography is prohibited" and that "use of deadly force is authorized") Groom Lake Road descends eastward to the floor of the Tikaboo Valley, passing the dirt-road entrances to several small ranches, before joining with Nevada State Route 375, the "Extraterrestrial Highway", south of Rachel. Groom Lake is not a conventional airbase, and frontline units are not normally deployed there. It appears, rather, to be used during the development, test and training phases for new aircraft. Once those aircraft have been accepted by the United States Air Force, operation of that aircraft is generally shifted to a normal air force base. Groom is reported, however, to be the permanent home for a small number of aircraft of Soviet design (obtained by various means). These are reportedly analyzed and used for training purposes. Soviet spy satellites obtained photographs of the Groom Lake area during the height of the Cold War, but these support only modest conclusions about the base. They depict a nondescript base, airstrip, hangars, and so forth, but nothing that supports some of the wilder claims about underground facilities. Later commercial satellite images show that the base has grown, but remains superficially unexceptional. Groom Lake was used for bombing and artillery practice during World War II, but was then abandoned until 1955, when it was selected by Lockheed's skunkworks team as the ideal location to test the forthcoming U-2 spy plane. The lakebed made for an ideal strip to operate the troublesome test aircraft from, and the Emigrant Valley's mountain ranges and the NTS perimeter protected the secret plane from curious eyes. Lockheed constructed a makeshift base at Groom, little more than a few shelters and workshops and a small constellation of trailer homes in which to billet its small team. The first U-2 flew at Groom in August 1955, and U-2s under the control of the CIA began overflights of Soviet territory by mid-1956. During this period, the NTS continued to perform a series of atmospheric nuclear explosions. U-2 operations throughout 1957 were frequently disrupted by the Plumbbob series of atomic tests, which exploded over two dozen devices at the NTS. The Plumbbob-Hood explosion on July 5 scattered fallout across Groom and forced its (temporary) evacuation. As the U-2's primary mission was to overfly the Soviet Union, it operated largely from airbases near the Soviet border, including Incirlik in Turkey and Peshawar in Pakistan. Even before U-2 development was complete, Lockheed began work on its successor, the CIA's OXCART project, a Mach-3 high altitude reconnaissance aircraft later known as the SR-71 Blackbird. The Blackbird's flight characteristics and maintenance requirements forced a massive expansion of facilities and runways at Groom Lake. By the time the first A-12 Blackbird prototype flew at Groom in 1962, the main runway had been lengthened to 8500 ft (2600 m), and the base boasted a complement of over 1000 personnel. It had fueling tanks, a control tower, and a baseball diamond. Security was also greatly enhanced, the small civilian mine in the Groom basin was closed, and the area surrounding the valley was made an exclusive military preserve (where interlopers were subject to "lethal force"). Groom saw the first flight of all major Blackbird variants: A-10, A-11, A-12, RS-71 (renamed SR-71 by USAF Chief of Staff Curtis LeMay and not by a presidential error as popularly believed), the abortive YF-12A strike-fighter variant, and the disastrous D-21 Blackbird-based drone project. The first Have Blue prototype stealth fighter (a smaller cousin of the F-117 Nighthawk) first flew at Groom in late 1977. Testing of a series of ultra-secret prototypes continued there until mid-1981, when testing transitioned to the initial production of F-117 stealth fighters. In addition to flight testing, Groom performed radar profiling, F-117 weapons testing, and was the location for training of the first group of frontline USAF F-117 pilots. Subsequently active-service F-117 operations (still highly classified) moved to the nearby Tonopah Test Range and finally to Holloman Air Force Base. Since the F-117 became operational in 1983, operations at Groom Lake have continued unabated. The base and its associated runway system have been expanded, and the daily flights bringing civilian commuters from Las Vegas continue. Some commentators, after examining recent satellite photos of the base, estimate it to have a live-in complement of over 1000 people, with a similar number commuting from Las Vegas. In 1995 the federal government expanded the exclusionary area around the base to include nearby mountains that had hitherto afforded the only decent overlook of the base. Subsequently, limited views of the area are available only from the summits of several distant mountains, particularly Tikaboo Peak (37°20′40″N, 115°21′32″W), around 26 miles (42 km) to the east. Rumored aircraft that have supposedly been tested at Groom include the various classified UAVs, a small stealthy VTOL troop-transport aircraft, a stealthy cruise missile, and the hypothetical Aurora hypersonic spy plane. Some also claim the initial testing of the Northrop Tacit Blue stealth demonstrator aircraft was conducted at Groom. EG&G JANET 737s at McCarran. Defense contractor EG&G maintains a private terminal at McCarran International Airport in Las Vegas. A number of unmarked aircraft operate daily shuttle services from McCarran to sites operated by EG&G in the extensive federally controlled lands in southern Nevada. These aircraft reportedly use JANET radio call signs (e.g., "JANET 6"), said to be an acronym for "Joint Air Network for Employee Transportation" or (perhaps as a joke) "Just Another Non-Existent Terminal". EG&G advertises in the Las Vegas press for experienced airline pilots, saying applicants must be eligible for government security clearance and that successful applicants can expect to always overnight at Las Vegas. These aircraft, painted white with red trim (the livery of now defunct Western Airlines), include Boeing 737s and several smaller executive jets. Their tail numbers are registered to several unexceptional civil aircraft leasing corporations. They are reported to shuttle to Groom, Tonopah Test Range, to other locations in the NAFR and NTS, and reportedly to Naval Air Weapons Station China Lake. Observers counting departures and cars in the private EG&G parking lot at McCarran estimate several thousand people commute on JANET each day. A bus runs a commuter service along Groom Lake Road, catering to a small number of employees living in several small desert communities beyond the NTS boundary (although it is not clear whether these workers are employed at Groom or at other facilities in the NTS). The bus drives down Groom Lake Road and stops at Crystal Springs, Ash Springs, and Alamo. Area 51 border and warning sign. "Camo dudes" in their vehicle watch from the ridgeline. The U.S. government does not explicitly acknowledge the existence of the Groom Lake facility, nor does it deny it. Unlike much of the Nellis range, the area surrounding the lake is permanently off-limits both to civilian and normal military air traffic. The area is protected by radar stations, and uninvited guests are met by helicopters and armed guards. Should they accidentally stray into the exclusionary "box" surrounding Groom's airspace, even military pilots training in the NAFR are reportedly grilled extensively by military intelligence agents. Perimeter security is provided by uniformed private security guards working for EG&G, who patrol in desert camouflage Jeep Cherokee and Hum-Vee vehicles. Although the guards are armed with M16s, no violent encounters with Area 51 observers have been reported; instead the "camo dudes" generally follow visitors near the perimeter and radio for the Lincoln County sheriff. Modest fines (of around $600) seem to be the norm, although some visitors and journalists report receiving follow-up visits from FBI agents. Some observers have been detained on public land for pointing camera equipment at the base. Surveillance is also conducted using buried motion sensors and by HH-60 Pave Hawk helicopters.